The Jersey Devil has worked its way into the pop culture of the area, even lending its name to New Jersey's team in the National Hockey League. There is currently a $10,000 reward for the capture of the New Jersey Devil, a creature with bat-like wings, a horses head, hooves, and large glowing eyes that stalks the pine barrens of New Jersey. Although many have tried, no one has yet to claim the prize. MANY PEOPLE CLAIM TO HAVE SEEN OR ENCOUNTERED THE JERSEY DEVIL OVER THE YEARS. AND ACTUALLY SOME CLAIM TO BE DIRECT RELATIVES AS THESE REAL NEW JERSEY DEVIL VIDEOS WILL SUGGEST.. Most accounts of the Jersey Devil legend attribute the creature to a "Mother Leeds", a supposed witch of whom it is said that after giving birth to her 12th child, stated that if she had another, the devil could take it. According to the story her wish was granted, and upon the birth of her 13th child, the grotesque offspring flew off into the surrounding pines. Read more stories about the Jersey Devil or enjoy more spooky folklore in Spooky New Jersey by S.E. Schlosser. According to legend, while visiting the Hanover Mill Works to inspect his cannonballs being forged, Commodore Stephen Decatur sighted a flying creature flapping its wings and fired a cannonball directly upon it to no effect. Joseph Bonaparte, eldest brother of Emperor Napoleon, is also said to have witnessed the Jersey Devil while hunting on his Bordentown, New Jersey estate around 1820. Throughout the 1800s, the Jersey Devil was blamed for livestock killings, strange tracks, and reported sounds. In the early 1900s, a number of people in New Jersey and neighboring states claimed to witness the Jersey Devil or see its tracks. Claims of a corpse matching the Jersey Devil's description arose in 1957. In 1960, the merchants around Camden offered a $10,000 reward for the capture of the Jersey Devil, even offering to build a private zoo to house the creature if captured. Emitting shrill cries and leaving its footprints in mud and snow, it has roamed the Pine Barrens of South Jersey for almost three hundred years. It is usually said to resemble a composite of several different animals, but it walks upright and is believed to be the child of a human mother. It is often associated with witchcraft and devil worship, yet it sometimes travels in the company of beautiful golden-haired girl. And it has lent its name to everything from small businesses to a professional hockey team. What is this mysterious creature? The Jersey Devil course! 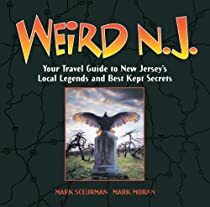 And in this brand-new collection of fascinating legends and lore, you will learn more than ever before about New Jersey's most infamous resident. More than twenty years after their first book about the Jersey Devil was published, James F. McCloy and Ray Miller Jr.'s, new research into this phenomenon continues to intrigue readers. Using historical accounts and interviews with New Jerseyites, many of whom were eyewitnesses to the creature's actions, the authors try to piece together the mystery that is the Jersey Devil. Despite the variations and contradictions that have shaped its story through the years, one thing is certain: the legend of the Jersey Devil is not likely to disappear anytime soon. And as one believer notes, "Behind every tradition...there's something real." Does the Jersey Devil actually exist, leaving its fearsome mark throughout the region? Or is it simply a hoax, grown to epic proportions through years of storytelling? Open Phantom of the Pines-if you dare-and decide for yourself.